All of us realize we are surrounded by “stuff” or more precisely, matter. But getting a handle on the various types of matter around us is a different story. It is a little like walking down a shopping mall with stores that have no store signs labeling what kind of goods they sell. All you can do is look through the windows to get an idea of what they offer for sale. To sort out the kinds of stuff that surround us, chemists look at the physical and chemical properties of matter and classify it in to various groups. One of the largest distinctions is between pure substances and mixtures. Pure substances (or just substances) are homogeneous (that is, the same throughout) and have a definite composition, which means they have simple whole number ratios (by mass) between elements that make them up. These are the elements (like gold or carbon) and compounds,(like salt or calcium carbonate) that we tend to spend a lot of time studying in chemistry, because they are the building blocks for all the other types of matter we encounter. Mixtures on the other hand are a bit messier. They are combinations of two or more materials. This means mixtures can usually be separated back into their original materials by physical processes. A good non-chemical example of a mixture is a jar of mixed nuts, or a drawer with miscellaneous kinds of screws, bolts and washers. Solutions, suspensions and colloids are similar in that they are combinations of smaller amounts of solute in larger amounts of solvent. The main reason for the varying characteristics among them is the particle size of the solutes. Emulsions are a special case. An emulsion can be made with two liquids that would normally not mix, such as oil and water. In the case of mayonnaise an egg yolk, which contains the emulsifier lecithin, is used to suspend the oil in tiny droplets. The lecithin coats the oil droplets so its “fat loving” side is on the inside with the fat, while the “water loving” side faces the aqueous solvent side. Although solutions are often introduced with examples such as sugar dissolving in a pitcher of water for Kool-Aid, solute-solvent relationships can involve various phases beyond solids in liquids. Air is a common example of a gas-gas solution and soda is carbon dioxide gas dissolved in liquid water. Hydrogen gas can dissolve in palladium metal as an example of gas-solid solutions. You might be wearing a solid-solid solution right now in the form of alloy metals used in jewelry. Similar phase combinations occur in suspensions and colloids. A nice challenge would be to come up with other everyday examples of various phases in solutions, suspensions, colloids or other mixtures. Finding other examples could help sort out the messy mix of mixtures that surround us! 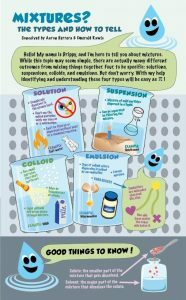 This graphic is a winning entry in the 2015-2016 ACS ChemClubs/ChemMatters Infographic Contest. Students, teachers, and other chem enthusiasts were challenged to take a chemistry topic and turn it into an original informational graphic. Entries were judged on originality, and the ability to convey accurate science details clearly and creatively. This infographic was conceived by Aaron Herrera and Emerald Rawls from Mapleton Expeditionary School of the Arts in Thornton, CO.